The social organization of criminal courts is the theme of this collection of articles. 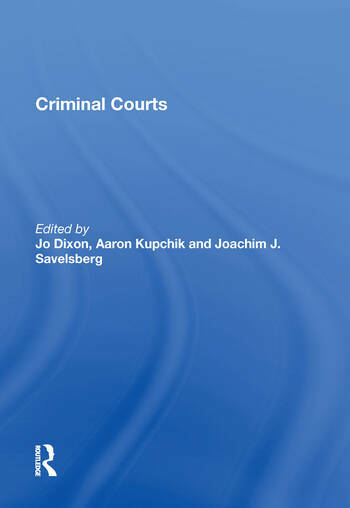 The volume provides contributions to three levels of social organization in criminal courts: (1) the macro-level involving external economic, political and social forces (Joachim J. Savelsberg; Raymond Michalowski; Mary E. Vogel; John Hagan and Ron Levi); (2) the meso-level consisting of formal structures, informal cultural norms and supporting agencies in an interlocking organizational network (Malcolm M. Feeley; Lawrence Mohr; Jo Dixon; Jeffrey T. Ulmer and John H. Kramer), and (3) the micro-level consisting of interactional orders that emerge from the social discourses and categorizations in multiple layers of bargaining and negotiation processes (Lisa Frohmann; Aaron Kupchik; Michael McConville and Chester Mirsky; Bankole A. Cole). An editorial introduction ties these levels together, relating them to a Weberian sociology of law. Contents: Series preface; Introduction; Part I Macro-Level Organization: Law that does not fit society: sentencing guidelines as neoclassical reaction to the dilemmas of substantivized law, Joachim J. Savelsberg; Between citizens and the socialist state: the negotiation of legal practice in socialist Cuba, Raymond J. Michalowski; The social origins of plea bargaining: conflict and the law in the process of state formation, 1830-1860, Mary E. Vogel; Crimes of war and the force of law, John Hagan and Ron Levi . Part II Meso-Level Organization: Two models of the criminal justice system: an organizational perspective, Malcolm M. Feeley; Organizations, decisions, and courts, Lawrence B. Mohr; The organizational context of criminal sentencing, Jo Dixon; The use and transformation of formal decision-making criteria: sentencing guidelines, organizational contexts, and case processing strategies, Jeffery T. Ulmer and John H. Kramer. Part III Micro-Level Organization: Convictability and discordant locales: reproducing race, class, and gender ideologies in prosecutorial decisionmaking, Lisa Frohmann; Youthfulness, responsibility and punishment: admonishing adolescents in criminal court, Aaron Kupchik; Guilty plea courts: a social disciplinary model of criminal justice, Mike McConville and Chester Mirsky; Rough justice: criminal proceedings in Nigerian magistrates courts, Bankole A. Cole Name index.